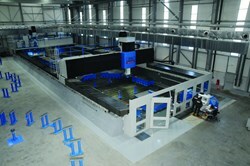 Gantry machine used for radial plate final machining operations (© SIMIC). Manufacturing has begun for the 70 large D-shaped radial plates that will hold the conductor in place within ITER's toroidal field coils. Following the prototype and machining trial stages, manufacturing has been launched at CNIM Industrial Systems (France) and SIMIC Spa (Italy); each firm is responsible for producing 35 radial plates. Two pre-machined radial plates await electron beam welding operations in the welding shop (© CNIM/Christophe Chabert). To fulfil the contract from the European Domestic Agency, CNIM has renovated its Brégaillon industrial site and added a brand-new 3,000 m² production hall close to the sea to facilitate the transportation of the large components. The new building is fully air-conditioned to keep equipment at a constant temperature during its final machining. A 9 x 36 m portal machining centre is ready to machine two radial plates simultaneously to a precision of several tens of microns, according to Jean-Claude Cercassi, CNIM Commercial Development Manager. Work is progressing quickly now that the first batches of raw material have been delivered. "The stainless steel segments have been machined and we are about to start with the electron beam welding," Cercassi explains, an activity made possible by the installation of a dismountable vacuum chamber. SIMIC Spa built a new industrial building in Porto Marghera to accommodate the production of the radial plate prototype, with brand new facilities and tooling in order to support the production of the radial plates. A massive portal machine has been installed that will operate in addition to one used for the machining of the prototype. SIMIC Spa's Marianna Ginola explains. 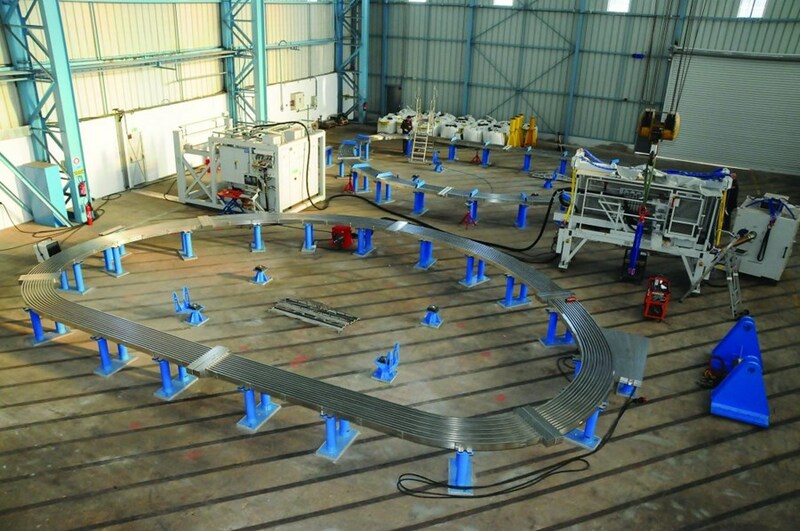 "The manufacturing phase of the radial plates is the most exciting part of our contribution to the Project. Our new building is ready, new tooling is in place. The production of the radial plates has started! 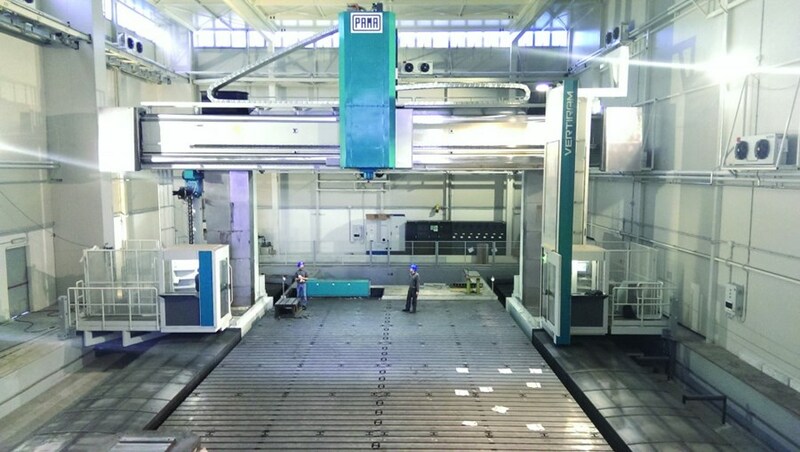 This is a turning point for the Project because the design starts taking shape and the impressive milling machine that SIMIC has invested in is put into operation. Our expertise will be fully deployed to deliver these key components." Gantry machine for final machining operations on two radial plates simultaneously (© CNIM/Christophe Chabert). The first radial plates are scheduled to be completed in July, when they will be transported by sea to La Spezia (Italy) to be fitted inside the ITER toroidal field coils at a facility run by ASG Superconductors. After producing a second batch five weeks later, CNIM and SIMIC Spa are expected to accelerate production to the rate of one plate every four weeks. To learn more about the manufacturing of toroidal field coil components click here. To read the original story on the Fusion for Energy website, click here.